Try a Wood or Deck Stain Before you Buy! Pick as many colors as you would like by placing a check next to each then click "Add to Cart". Colors for all brands towards bottom of page. All samples except Penofin ship for $8 each with no additional shipping charge. Penofin samples are free but have a $4 shipping charge each. Sample size volume is roughly 1.5-2 oz. Once you decide to purchase a stain from our site, you can use the money you spent on the sample(s) towards the purchase of a 5 Gallon Pail of stain! Maximum $15 discount per customer. Instructions on how to do this will be included with your samples. North of the city. Our 2 tared deck last used Bear but it peeled and was hard to remove. We pressured washed and hand sanded. what brand of semi-transparent stain would hold up best in our area? 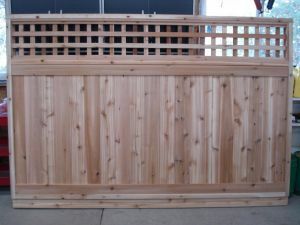 We live in eastern Ontario and are building a western red cedar t&g fence. Want to keep the natural look of the red cedar. Would the Armstrong Clark Natural Tone be a good choice? The Natural will work for this fence. It does enhance the grain similar to if wet with water. I have a 1.5 year old cedar fence that has not been stained yet. I would like a transparent stain on the yard side. I like the look when wet. The back of the fence, I would like something that will last longer so transparency isn't important. I live in SoCal. I have a two year old weathered cedar deck, will be cleaning and brightening in a few weeks. It's never been stained. What would you reccomend to get that oiled look? I tried a semi solid, the colour looks too matte for my liking. I have read that sealing cedar produces a nice oiled look, but it flakes off or peels within a few years. Is there a product that will give a good gloss, while also allowing the wood to breathe? I live in Toronto, Canada. Harsh winters, hot summers. You cannot add a shine or gloss to exterior wood. It will fail. Must be a penetrating finish without the shine. Hello. What was the response to your question? I live in Ottawa with same scenario and request. Thanks! follow up. to older pine deck. I forgot to mention. i'm referring to Armstrong and Clark stain. thanks again. 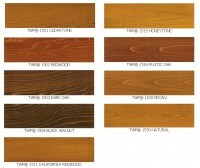 The Redwood Tone is a lighter pigment than the Sierra Redwood. The new Chestnut color may work as well for you. Biowash is not made anymore. You can use the Restore A Deck Kits. For shipping costs, add to cart and enter the shipping info. Good morning, Do you sell Bio wash or simple wash made by bio wash? How much per gallon and can it be shipped to Canada? If not, do you have a similar product that will remove mildew stains from a log home? Please call us to place a sample order for the Defy Butternut. I see your Defy samples, but they don't seem to match the full color list of the new Defy Extreme line. 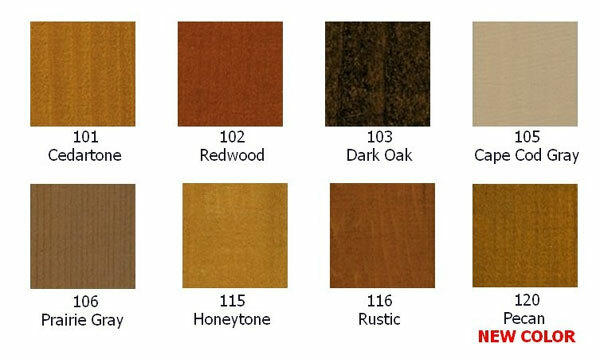 I'm interested in the cedar tone, light walnut and also butternut, but I don't see butternut available as a sample. Sequoia is closest but not the same. It is not that much different as far longevity. Just slightly better color retention. My deck gets lots of sun so you recommended a semi solid. My wife ordered a sample of the sierra redwood which is semi transparent and of course she likes the color. On the website it shows it as having quite a bit of red but on our treated pine it is quite brown..(which she likes) IN a semi solid which color do you think would be closest to the Sierra Redwood? OR how much protection do we lose if we went the the semi....???? We can ship all stains except TWP 100 and 1500.